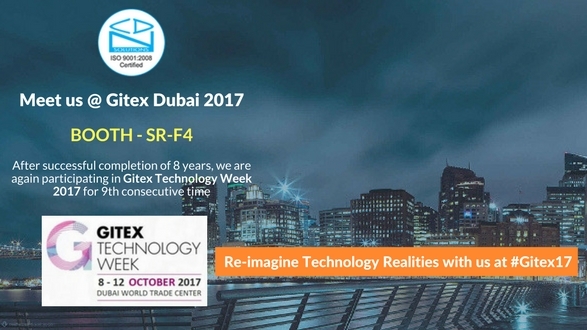 When the world is buzzing already with the latest Technologies in hand, another super-tech event will mark the year in October 2017- the Gitex Technology Week 2017. The event will set in on the 8th of October and will wrap up on the 12th at the Dubai World Trade Centre. To put the immense scale of the event into perspective, it is crucial to know that it will be attended by a lakh and a half people from about a 100 countries! A little less than 5,000 exhibitors will display revolutionary state-of-the-art Technology in various sectors like AR (Augmented Reality), VR (Virtual Reality), IoT, Wearable Technology, and much more web and mobile technologies. The 37th chapter of the Gitex Dubai 2017 aims to bring together Technology enthusiasts, innovators, and investors, all under a single roof. Business leaders and IT Professionals look forward to the event alike for it gives them the opportunity to experience fresh Technologies before they hit the market. Technology players will bring to the event their setbacks and will look forward to the solutions being offered by leading and budding service providers present at the venue. It is a platform for growing businesses to showcase their expertise in the Tech-world on a truly Global level. The Gitex Technology week will unquestionably be filled up to the brim by the IT products and services businesses who are looking expand themselves through networks built at such an enormous event. A number of keynote speakers will impart their experiences and learnings to the audiences at the event. 1. AR and VR – With the onset of the first wave of AR apps hitting the iPhones, this vertical is one of the hottest trends in the market. Therefore, we expect to meet a number of AR and VR solutions providers at Gitex Dubai 2017. 2. IoT – The most looked out for field in the Technological world as of now is Internet of Things. The concept of enabling all things around to be able to connect to the Internet has led to a boom in the industry. 3. Wearables – The idea of bending a smartphone into a wrist watch is the due reality, and it the pushing of limits through this area that has led to many cool and ‘handy’ technologies. 4. Cloud based Services – At the base of IoT lie all cloud-based services. Be it the idea of smart healthcare, smart cities, or smart manufacturing, all of it boils down to services that can be accessed and managed from anywhere around the world. The Gitex 2017 Dubai will also boast of Global Smart Cities Technology which will attract Government personnel from various nations, owing to the fact that “Smart Cities” is a reality in some developed nations and all others would want to follow the trail. CDN Solutions group is one of the IT companies to be a part of the offering side at Gitex Dubai 2017. This will be the 9th consecutive year of CDN Solutions Group to exhibit in Gitex Technology Week. Apart from the aforementioned areas, CDN Solutions Group will also put on public view its solutions concerning Fintech- that enable banking and financial services to thrive with cutting-edge technologies, and various other mobility solutions. Do meet CDN Solutions Group in Gitex Technology Week 2017 at stand SR-F4 for first-hand Technologies, and stay ahead of the curve during 8th – 12th Oct, 2017 at Sheikh Rashid Hall, Dubai World Trade Center.